With no regular work available or family savings to fall back on, Sandrine Ouiya and her father (pictured) were facing tough choices. Whilst day labourer work brought some money in, the Ouiya family live on little more than $1 a day and there was barely enough family income to provide food for Sandrine’s parents and her three siblings. ‘Luxuries’ such as school fees and uniform were our of the question and, as a result, Sandrine faced having to leave school. At Transform Burkina we believe all children should have the right to an education and no family should be in the position of having to make a choice between sending their children to school and putting food on the table. Through our bursary scheme we aim to support more children to go to school, with that support being offered to some of the poorest families in Burkian Faso. Sandrine was accepted on to the bursary scheme and can now return to her school near Ouagadougou, which is a daily walk of an hour from her home. Her fees and other costs are paid, thanks to the generous support of UK donors. 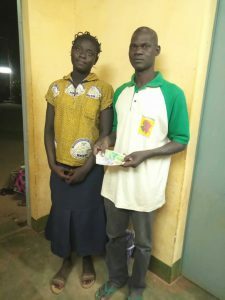 Her father is pictured receiving the latest instalment of school fees, a gift that that will allow his daughter the chance to transform her future..
By creating these scholarships, poor but hard-working and intelligent children, will (have) many opportunities. I have (an) ambition to embrace a career in public service work. All my gratefulness is to Transform Burkina’.